1 Aprile 2019 – W.A.P. A nice and instructive movie on Macquarie island in which appears Kevin VKØKEV from 13mns 00s to 13mns 45s, will lead the Antarctic Chasers through this fascinating Sub Antarctic island, full of history and Research sites. Out of those already known, there are other four Huts that merit a stop by. 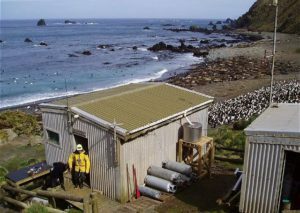 Hurd Point Hut (54° 46.3′ South, 158° 49.6′ East) is the most remote of all the field huts on Macquarie Island. 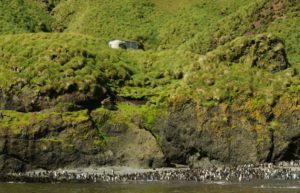 It is located approximately 32 km south of Macquarie Island station and comfortably sleeps four people. The trek to Hurd Point is generally completed over two days, with an overnight stop at Green Gorge or Waterfall Bay. The site was originally part of an auroral observatory complex established in 1953 in order to carry out simultaneous observations in conjunction with the station. 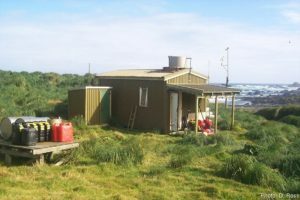 Today the hut is mainly used as a base for research in the southern sector of the island and serves as an important base for albatross researchers during summer. Green Gorge Hut (54° 37.9′ South, 158° 53.9′ East) is located on the east coast approximately 15 km south of Macquarie Island station, roughly halfway down the island. It consists of a comfortable Canadian log cabin built to accommodate five to six people, a food store and storage shed. It is a favorite field hut for many expeditioners. Green Gorge Hut is very popular as a place to enjoy an overnight break on a journey from one end of the island to the other. The Hut is readily accessible from the overland track or via inflatable rubber boat. 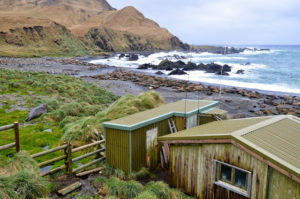 Bauer Bay Hut (54° 33.3′ South, 158° 52.6′ East) is located on the rugged west coast of Macquarie Island approximately seven km southwest from Macquarie Island station. The hut is easily accessible and is the only hut located on the exposed windswept rugged west coast. The hut accommodates four to five people and is popular with expeditioners travelling down the island or as a weekend retreat for station-based personnel. The hut is well placed to provide a stepping off point for trips to the north or south of along coastal walking routes. The Hut is accessed via the Island Lake track, or via the Bauer Bay track that links up with the overland track. It can also be accessed by the featherbed track along the north-west coast. The Featherbed and coast to the north of the hut is designated category one Special Management Area and is generally open for to access from June to July. The featherbed south of the hut is designated category two Special Management Area and is generally open to access from April to August. Caroline Cove Hut –54° 45.8′ South, 158° 47.5′ East- (Last pic to the Left) is located at the foot of Mt.Haswell, in the spectacular Caroline Cove area ; this is within a Specially Managed Area (SMA) with access year-round limited to people approved through a TASPWS access permit.